Duck hunting is one of the most fun activities of the fall, but for those who don’t have dogs or are bored in the mid-day hours, there is a way to hunt and get some exercise. Ducks tend to lay low during the day and hole up in creeks, river bottoms and other marshy areas. You can take advantage of these by being stealthy and active and jumping them off these “puddles”. Follow these tips to get ducks during the day with or without a dog by puddle jumping ducks. Staying quiet will help you get closer to the ducks and get easier shots. If they hear you sloshing through the marsh, they’re going to be gone before you get to them. Binos are one of the best hunting tools ever invented for anything, including ducks. Scan from roads and fields where you know there are swampy areas that ducks like to be in and you can scout while you hunt. This helps narrow down hunting spots more quickly. Waders can make a hot walk, but having these or knee boots will ensure that you get your ducks if you don’t have a dog. You don’t want to lose that meat, so make sure that you’re prepared to grab what you shoot. Using the improved cylinder choke will allow you to get close shots at jumping ducks without destroying all of the meat. I like to use #4 Steel shot for puddle jumping ducks without a dog. 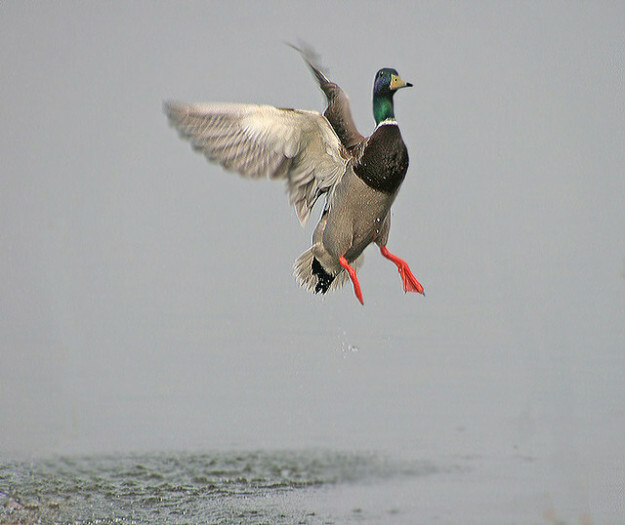 Try puddle jumping mid-day ducks this fall and see what you bring home. You may be surprised at all of the waterfowl you can get at while taking that walk during the day.